Starting and completing an organizing project can be hard — it takes time and continued focus on your goals. Some people get motivated when their frustrations become overwhelming. They are tired of not being able to find things, of feeling embarrassed by their homes, etc. Sometimes people find their motivation in something they’ve read. 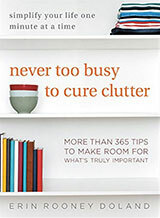 Although organizers often find a collection of unused organizing books on people’s bookshelves, sometimes reading just the right book (Erin’s latest book, Marie Kondo’s book, etc.) at the right time can provide the inspiration needed. 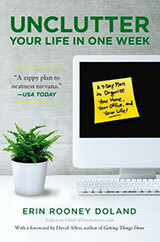 Other people get motivated by images of organized spaces they see in magazines or on Pinterest. While these photos are often unrealistic — I’ve never met anyone whose home looks as picture-perfect as those shown in magazines — they can still inspire some people to imagine what their homes might look like and start taking steps in that direction. For other people, the best way to stay motivated is to have a deadline. That can be a self-imposed deadline or one that comes from others: the IRS, family members, etc. I’ve seen people who had talked about getting organized for years, with no success, who became successful once they had deadlines they had to meet. I’m going to adopt, and the agency is coming to do a home visit. My parents are coming to visit, and I want my home to look good when they get here. I need to file my tax returns, so I have to get my papers organized. My boss gave me a month to get more organized. I’m replacing my broken garage door in a few weeks, and I have to clear out my packed garage before then. I’m moving in a month, and I can’t take everything with me. I’m going to be getting a roommate, so I need to unclutter the room she will be renting from me. I’ve made an appointment for next month with someone who may want to buy some of my stuff. I’ve told the storage facility that I plan to give up one of my three units next month. I committed to my therapist/coach that I’d get going on this project before our next visit. I want to participate in our neighborhood garage sale. I promised my sister-in-law that I would send her the clothes my kids have outgrown, because they’ll be just the right sizes for her kids. Note that if you are setting your own deadline, you can make sure it’s a realistic one for you. If you have multiple storage lockers, you can set a deadline for clearing out one of them at a time. You can set deadlines that are a month out, not next week. And finally, many people are motivated by seeing progress. If you can find something that motivates you to begin the uncluttering and organizing process, you may find it easier to stay motivated to continue. Are digital Everything Buckets a good filing system? Services like Evernote and Pocket make a compelling case in favor of the Everything Bucket: capturing information is easy (simply save information and don’t spend time filing it into a topic-related folder) and finding what you need when you need it is easy with a powerful search engine (search with keywords instead of drilling through folders). Meanwhile, the idea of all your stuff in a pile, be it digital or physical, makes some people itch. Everything is together! In one place! There is no order! The choice to use an Everything Bucket versus filing data into subfolders is a personal one and there are advantages and disadvantages to the Bucket system when considering it. Knowing the strengths and weaknesses can help you make a decision for what filing system is right for YOU. As mentioned above, adding new items to an Everything Bucket is a breeze. Evernote’s web clipper, for example, lets you quickly stash any page you like. You can even grab a specific snippet from a website, if a paragraph is all you need. Meanwhile, desktop shortcuts make it just as easy to add items as you work. Tagging helps you find items later. Simply attaching a tag like “recipe” or “receipts” to an item, you can make it easy to find information later when you do your search. Speaking of search, that really is the marquee feature of programs like Evernote and Pocket. Simply open the “bucket app” of your choice, enter a word or phrase into its search bar and up pops what you need. You also can go paperless and have access to your stuff virtually wherever you are, even on a mobile device. It sounds like a good deal, right? But there are downsides. First up in the strikes against the Everything Bucket: they discourage the use of a structured file system. In exchange for ease and speed, you let the computer make sense of your collection. It will do just that, as computers are more effective with organized data. The program will build an index to make sense of that pile, which takes time and effort. If you’re a Mac owner and you have a slow machine pretty much immediately after updating the operating system, it’s likely because Spotlight is making a new index of your disorganized data. In the case of an Everything Bucket, you’re inviting an application into your daily workflow that could possibly go out of business in the next couple years. If it does, hopefully you’ll be given notice so you can export your data or, at the very least, operate the existing app but not be able to add more information to it. There is a middle ground, should these Everything Bucket concepts only partially make your skin crawl. Recipes I want to try are handled by Paprika. Web links for things I want to go back and read are saved to Pocket. Instead of filing into subfolders, it’s as if I’m filing into apps. Within those apps, however, there are no subfolders, only an Everything Bucket. I spent the past weekend doing some serious weeding, planting, replanting, and general work in the yard. It looks great and that’s in part due to the tools I’ve organized for outdoors. It’s nothing fancy, but I thought I’d share with you the solutions I created. The following are what you can do in just a few minutes to make your gardening and yard care more efficient and organized. 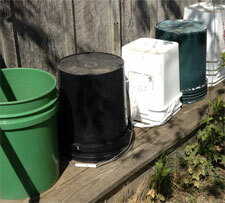 The most important tool I have for use and organizing outdoors is the five-gallon bucket. My love affair with this incredible tool is well-documented. You can buy one for very little money at your local big-box home improvement store. I improve the usefulness of my buckets with a TEHO Garden Organizer Caddy, which can be had for about 12 dollars. It fits snugly on a five-gallon bucket, so it’s not flopping around. The Garden Organizer also adds a little padding to the handle, which is nice, as well as pockets galore. I love that I can store my tools and tote them around with the same product. It’s quite convenient. Some reviewers on Amazon have complained of the Garden Organizer not lining up with the handle on their buckets. That’s not been my experience, and I’ve used it on buckets I purchased at Home Depot as well as those from my local corner store. The only complaint that I do have is that the liner pretty much negates the buckets use as a container for anything other than your tools. If you’re weeding, for example, you’ll want another receptacle for those weeds you’ve pulled. But really, the organizer is so useful otherwise, I’m willing to let that go. If you’d rather not use a bucket, a carpenter’s belt will work fine (though hold fewer tools) or a good gardening tote. Finally, get fun and practical with storage by filling a terra-cotta pot with builder’s sand that you’ve dampened with mineral oil. As Real Simple points out, the combination of sand and oil will prevent the tools from rusting. One trick I learned years ago is that a fun toy, gadget, or tool can make a task I dislike more pleasant to do. My FitBit encourages me to walk, for instance. Likewise, a beautiful ledger helps me work on my family’s budget. With this in mind, I decided to tackle another chore I typically avoid: Yard work. Yard work isn’t so bad in the spring and fall, when the weather is nice and it’s pleasant to be outdoors. But in the summer, ugh. Heat, humidity, and the ever-present, thin layer of sweat prompt me to procrastinate and then grumble the entire time I finally do it. To get past this frustration, I discovered three tools that I enjoy so much, I’m eagerly willing to push my way through the humidity and heat and do a little yard work. After one use I was a complete convert. 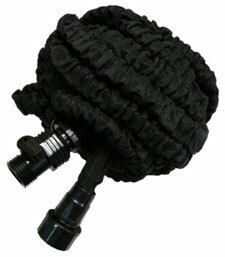 This lightweight hose does in fact expand at an impressive rate, without sacrificing durability. It feels well-made. When you’re done, simply spray out any remaining water and watch it grow smaller and smaller. The result is lightweight and flexible enough to be stored away with ease. The second item is The Handy Camel, which is a Chip Clip on steroids. I do a lot of planting, and I’m often hauling heavy bags of soil around. They’re awkward, floppy, and love to spill. Enter the Handy Camel. This thing does in fact behave like a Chip Clip. Just snap it over the opening of a 40-pound bag and use the handle to carry it around like a suitcase. The third item puts an end to spilling gasoline when trying to fill your gas-powered lawn mower. 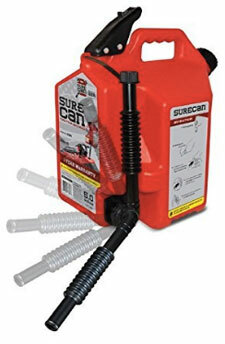 The Surecan stops that mess. They’re made of sturdy plastic and the brilliant inverted design lets you fill a small-engine tank with the ease of a trigger. No more smelling like gas for the rest of the day or worse, accidentally splashing gas on hot parts of the mower. I’m not usually one to recommend buying more stuff to stay productive, but if a tool or gadget makes a task so much more enjoyable that you actually do it and don’t hate it, I’m all for it. Simple living is about living free of distractions — and loathing an activity is certainly a distraction. Should you buy a commercial or a residential vacuum? Over the past week, I’ve been doing a lot of commercial cleaning. I’m using powerful chemicals and exceptional hardware, like vacuum cleaners and shop-vacs that are built to endure lots of use. This made me think: should I use commercial cleaning products at home? They’re effective and built to last forever. But are they appropriate for domestic cleaning? The short answer is no, as commercial cleaners and domestic products are built to perform different jobs in different environments. A perfect illustration of this is the vacuum cleaner. Should I buy a commercial [insert product you’re considering] for my home? In the case of a commercial vacuum cleaner, it’s an attractive idea, isn’t it? Commercial vacuums are built to last and take more abuse than their residential counterparts. Let’s attack this question by looking at some pros and cons. I struggled with putting cost in the pro vs. con column, but eventually pro won out. Yes, a commercial vacuum is expensive. For example, I’ve been using a Sebo 370 at work, which retails around $870. That’s not cheap, but Dyson makes home models that are in the same range. The idea here is that a commercial model will have a longer life than a residential machine, thereby costing less in the long run. Readily-available parts. Big-box stores will infrequently stock parts for residential vacuums. If there’s an authorized retailer in your neighborhood you’re in luck (for example, I’m lucky enough to live near a Miele dealer). And you can often pick up parts for commercial units directly from the manufacturer or even a local distributor. So long as you’ve got that brand nearby, it isn’t an issue. If you don’t, this would move to the con column. As I noted earlier, commercial vacuum cleaners are built to last and withstand abuse. They’re built of high-quality components and often have longer cords and heavier bodies. They’re designed with superior structural integrity to help them endure daily use as well as getting banged around a bit. Lastly, they’re often more powerful than residential units. The first time I used a commercial machine I was amazed at what it picked up with a single pass. They’re less comfortable. The Sebo I use at work is heavy. While it feels substantial and solid while pushing around, just haul it up a flight of stairs a few times and the bloom starts to come off the rose. In general, home vacuums are designed to be lightweight and comfortable, while commercial units are meant to get a job done. This means a heavier machine, yes, but it also means that convenience items are missing like power control levels, that cool retractable cord, and tools for above-the-floor cleaning. In addition, many commercial units have a reusable cloth bag instead of the disposable units your home machine has. No fun. You have to clean that bag. I mentioned the power earlier and that sounds like a good thing, unless you have a delicate carpet. A commercial machine cares not about your precious carpets! It merely wants to get the job done. In fact, it can be too harsh for what you’ve got on the floor. Remember, these are meant for hotels, schools, and restaurants. In other words: industrial carpeting. Lastly, they’re loud. As in, you turn it on and reflexively say, “Wow, that is loud.” Pets will run, birds will leap from the trees, and bunnies will cover their big, floppy ears. Ultimately, when deciding between purchasing a commercial unit and a residential unit, it’s worth the time to weigh the actual pros and cons of the item before assuming the commercial unit is better for YOU. It might not actually be what you want, and you can end up creating clutter in your home and wasting money. Your to-do lists probably include many small tasks, but it’s likely that you also have some big projects you would also like to get done: getting in better shape, organizing your home, writing a book, planning a vacation or a major event, etc. An unrealistic plan is discouraging — no one likes falling behind. And creating an unrealistic plan means you’ll spend a good amount of time re-planning. When coming up with a plan, it’s always wise to remember Hofstadter’s Law: “It always takes longer than you expect, even when you take into account Hofstadter’s Law.” People always tend to underestimate — forgetting some tasks, being too optimistic on how long certain tasks will take, and ignoring all the ways things might go wrong. Try for realistic estimates of each task, and then add some overall contingency time. The more this project differs from anything you’ve done before, the more contingency time you’ll want. Doing nothing gets pretty dull. So you might as well write. Set aside dedicated time for X.
Tracking your progress against your plan is crucial in case adjustments are necessary. If your plan isn’t working, the sooner you realize the problem, the better. You’ll have more time to work with others, if necessary, to change the deadline, the scope, or the budget to create a more workable plan. Also, keeping track of your estimated times vs. your actual times will let you make better estimates in the future. Celebrating your progress can help keep you motivated. That can be something simple like a triumphant update on Facebook or Twitter, or (especially for major milestones) something more substantial — providing some sort of treat that’s meaningful to you. If your thoughts while uncluttering often include the phrase, “I might need it some day,” it might be time to defeat this nefarious excuse, and finally let go of things you don’t need. I totally get it. Why get rid of something you might need? I’ve got a scrap wood pile in the basement. It spends the majority of its existence simply sitting there, taking up space, harboring insects. Every now and then I’ll remove one item for a project or quick fix, but that’s about it. I dislike the idea of getting rid of it. But what would happen if I did? I would have to buy or borrow the item if I ever wanted it. That’s it. There isn’t a second or third item. If I got rid of that pile, there might come a day where I would have go to out and buy more wood. That will cost me both money and time. That’s true. What is the alternative? What would those costs be? In my experience, pretty small. I’ve concisely demonstrated that I rarely need wood from the pile. So that’s not really a big deal. What is significant is the fact that keeping it costs me, too. It costs me time in having to root through to find what I need. It costs me stress and guilt when I see it sitting there doing nothing. It costs useful storage space. It also makes me nervous because if the house were to catch on fire, that big pile of wood would be literal fuel for the fire. If I look at it honestly, I believe that these costs are worse than what I’d pay in cash and the time to run to the store. It’s possible that I’ll suddenly, urgently need something from that pile. If it’s gone, I’ll suffer a mild to major inconvenience. That stinks, but is it a huge problem? Again, let’s look at the ongoing inconvenience of maintaining that horde. The trouble with finding things, and the stress/guilt of living with a pile that I ignore 99 percent of the time outweighs my ability to respond to a hypothetical situation. Also, I could keep two pieces in the backyard shed instead of hundreds of pieces indoors and completely alleviate all fears related to a hypothetical emergency situation. We’ve written several articles on letting stuff go. Consider today’s conversation one you can have with yourself at the very beginning of that process. While giving up some items can be tough, the cost of keeping those things can be even worse. Recently I recommended becoming your family’s technology manager. With a little forethought, you can be on top of backups, passwords, and your devices. This week, I’m expanding that notion to include general home maintenance by creating a DIY Home Owner’s Manual that will save you time and money. I started my Home Owner’s Manual while repairing an old clothes dryer. Its drum had stopped turning, leaving a pile of warm, damp clothes. I grabbed the toolbox, unplugged the machine, and got to work. I Googled the model number to find the right part, which I bought from the hardware store. At home, I took notes while making the repair. I sketched the dryer, noting the screws that held the rear panel. I drew the interior, labeling the components. Next, I noted the model number and part number, and sketched out the process of replacing the rear panel. In a matter of minutes, the dryer was back in the clothes-drying business. I’ve since made pages about replacing the furnace filter, changing the lawn mower’s oil, and wiring our smoke detectors. Today, I have a fantastic reference to our home, written by me, that’s fully annotated, and you can do the same. You can very easily go digital with your manual, and make it tremendously easy to find just the page you need. First, get yourself an Evernote account, if you don’t already have one. 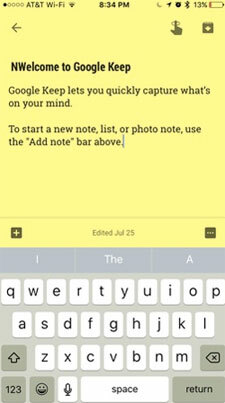 Make photo notes of your manual, tagging the images as appropriate. Now, you’ve got a ubiquitous, digital home owner’s manual you can reference on your mobile device. But there’s one more cool trick you can pull off as part of this digitizing process. Whenever you need your notes for that device, all you need to do is scan the QR code and presto! Evernote will launch and open the exact manual pages for you. A DIY Home Owner’s Manual can be an invaluable tool, and organizing one is easy. Take the time whenever you perform a home improvement or maintenance project to create the pages you’ll want again in the future. You’re creating a great reference that you can even pass on to others in your home or future homeowners if you sell your place.